Polycomb-group (PcG) proteins are part of an epigenetic memory system that regulates global gene expression throughout development in multicellular eukaryotes (Butenko and Ohad, 2011). Sophisticated mechanisms recruit high molecular weight complexes of PcG proteins to specific targets in the genome. Two major PcG complexes present in eukaryotes—POLYCOMB RESPRESSIVE COMPLEX1 (PRC1) and PRC2—each consist of four core subunits. In the canonical model of PcG repression, PRC2 is recruited to DNA sequences (Polycomb response elements; PREs) that contain specific cis-regulatory elements (such as GAGA factor binding motifs; Deng et al., 2013; Xiao et al., 2017) and trimethylates histone H3 Lysine27 (H3K27). PRC1 then binds to this histone mark (H3K27me3), ubiquitinates a lysine residue of histone H2A, and recruits complementary factors that lead to chromatin compaction and epigenetic silencing of genes in the region. Although PRCs are evolutionarily conserved in plants and animals, the proteins that recognize the H3K27me3 mark and the mechanisms of gene silencing differ between these kingdoms (Köhler and Villar, 2008). In an effort to identify novel proteins involved in PcG-mediated gene silencing in plants, Schatlowski et al. (2010) conducted a yeast two-hybrid analysis using a truncated form of CURLY LEAF (CLF), a catalytic subunit of Arabidopsis PRC2. In a follow-up study, Hohenstatt et al. (2018) screened the resulting list of potential CLF interaction partners for proteins containing putative chromatin reading domains. They identified a protein containing both a PWWP domain (implicated in methyl lysine/arginine binding; Maurer-Stroh et al., 2013) and a nuclear localization signal (NLS). Having confirmed that this protein interacts with CLF, and showing that it also interacts with two homologs of CLF, the authors named the protein PWWP-DOMAIN INTERACTOR OF POLYCOMBS1 (PWO1). The authors then showed that PWO1 and CLF, which both localize to the nucleus, form a complex in planta. 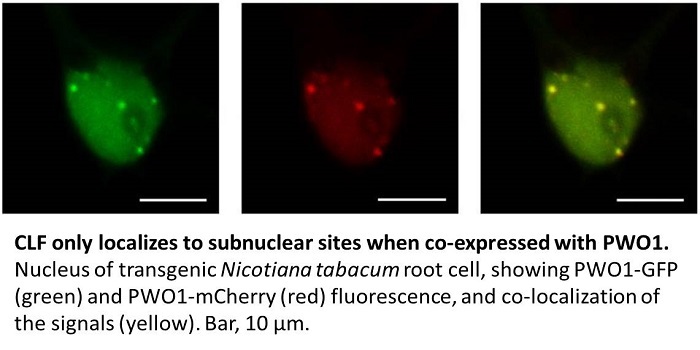 When GFP-CLF and PWO1-mCherry were heterologously co-expressed in Nicotiana tabacum leaf epidermal cells, the fluorescent proteins localized to nuclear speckles of unknown identity (see figure). As this localization pattern was not observed when GFP-CLF was expressed alone, PWO1 appears to recruit CLF to its target sites in the nucleus. Using a series of PWO1 deletion mutants, the authors showed that the PWWP domain of PWO1 is required for subnuclear targeting of PWO1. Furthermore, co-immunoprecipitation experiments showed that PWO1 binds to histone H3, and that the PWWP domain is necessary and sufficient for this binding. A point mutation in a conserved region of the PWWP domain reduced this binding. The PWWP domain bound to histone peptides harboring various combinations of modifications, including H3K27me, but not to those phosphorylated at H3S28 (H3S28p). Thus, H3S28p may antagonize binding of the PWO1-CLF complex to chromatin, and hence PcG-mediated gene silencing. Indeed, H3K27me3S28p was previously shown to be associated with transcriptional activation in human embryonic cells (Gehani et al., 2010). Finding that PWO1 belongs to a small gene family (PWO1–3) in Arabidopsis, and that the members of this family had almost identical expression patterns, the authors conducted a mutant analysis to compare their roles. The genes were found to have overlapping functions in regulating post-embryonic growth and meristem maintenance. Further analysis showed that PWO1 interacts genetically with CLF to maintain full histone H3 occupancy at several genes known to be targets of PcG. This study represents an important contribution to the field of plant epigenetics, revealing a novel class of histone readers and describing their possible role in recruiting PcG proteins to their subnuclear targets. Deng, W., Buzas, D.M., Ying, H., Robertson, M., Taylor, J., Peacock, W.J., Dennis, E.S., and Helliwell, C. (2013). Arabidopsis Polycomb Repressive Complex 2 binding sites contain putative GAGA factor binding motifs within coding regions of genes. BMC genomics 14, 593. Gehani, S.S., Agrawal-Singh, S., Dietrich, N., Christophersen, N.S., Helin, K., Hansen, K. (2010). Polycomb Group Protein Displacement and Gene Activation through MSK-Dependent H3K27me3S28 Phosphorylation. Molecular Cell 39: 886–900. Hohenstatt, M.L., Mikulski, P., Komarynets, O., Klose, C., Kycia, I., Jeltsch, A., Farrona, S., and Schubert, D. (2018). PWWP-DOMAIN INTERACTOR OF POLYCOMBS1 interacts with Polycomb-group proteins and histones and regulates Arabidopsis flowering and development. Plant Cell: doi.org/10.1105/tpc.17.00117. Köhler, C. and Villar, C.B.R. (2008). Programming of gene expression by Polycomb group proteins. Trends in Cell Biology 18, 236–243. Maurer-Stroh, S., Dickens, N.J., Hughes-Davies, L., Kouzarides, T., Eisenhaber, F., Ponting, C.P. (2003). The Tudor domain ‘Royal Family’: Tudor, plant Agenet, Chromo, PWWP and MBT domains. Trends in Biochemical Sciences 28, 69–74. Mozgova, I., and Hennig, L. (2015). The polycomb group protein regulatory network. 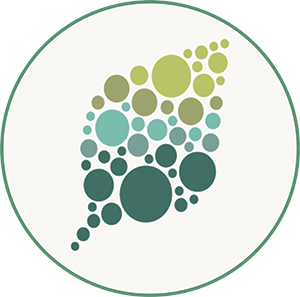 Annual Review of Plant Biology 66, 269–296. Xiao, J., Jin, R., Yu, X., Shen, M., Wagner, J.D., Pai, A., Song, C., Zhuang, M., Klasfeld, S., He, C., Santos, A.M., Helliwell, C., Pruneda-Paz, J.L., Kay, S.A., Lin, X., Cui, S., Fernandez Garcia, M., Clarenz, O., Goodrich, J., Zhang, X., Austin, R.S., Bonasio, R., Wagner, D. (2017). Cis and trans determinants of epigenetic silencing by Polycomb repressive complex 2 in Arabidopsis. Nature Genetics 49, 1546 –1552.